It's blogmas day eight and today I have a candle review for you all, I know, I know I'm a total candle addict at this time of the year, I just love how cosy and warm it makes the house feel and the festive scents are the best. I picked up a few more of the festive Yankee Candle votives a few weeks ago and there was one I couldn't wait to try first because I have never actually seen it before - Cherries On Snow. Cherries On Snow is absolutely gorgeous and is described as 'An enchanted, sparkling blend of bright, juicy cherries with sweet almonds and an icy freshness' which I would say is pretty much on point. I certainly get the sharp, juicy berries scent straight away when burning this, but longer the votive is burning for I start getting a sweet and spicy scents which makes it smell so festive and Christmassy, this comes from the votives mid notes of cinnamon and almond. The scent throw is quite full on, it's definitely not overpowering despite being quite strong but it does indeed fill the house with it's gorgeous festive scent very quickly and really lingers when blown out. 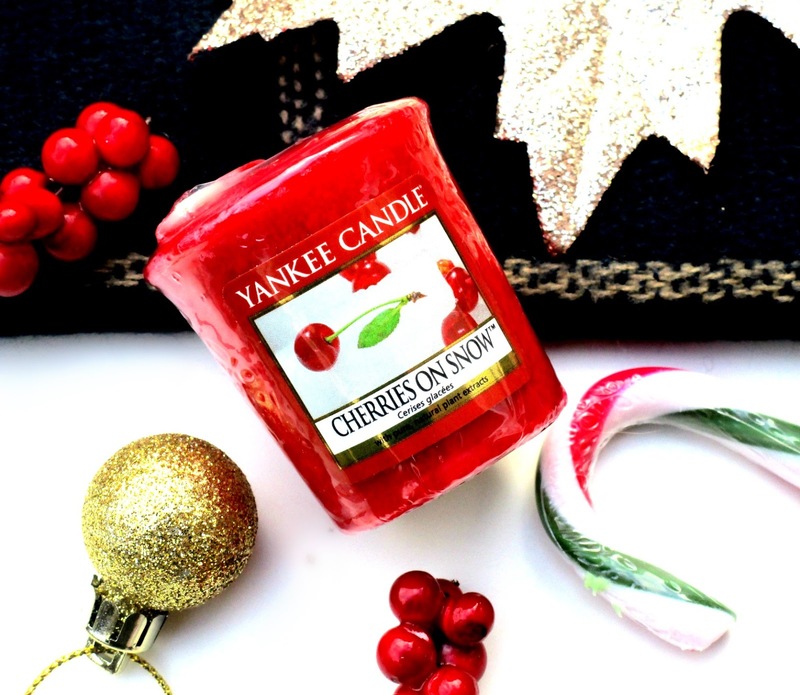 This particular scent really reminds me of a festive version of Yankee Candles Black Cherry candle which is one of my all times favourites, so if you like Black Cherry you will LOVE Cherries On Snow. Oddly Cherries On Snow isn't on the UK Yankee Candle website as of yet however it is on the American website which I find bizarre, I picked mine up from my local garden centre which had the complete Cherries On Snow collection so I'm really not sure why it's not on the UK site however... it is available to order online on the House of Fraser site if your interested in picking one up. All the Yankee Candle votive/samplers claim to provide up to 15 hours of fragrance and Cherries On Snow certainly lasts really well, I think because the scent really lingers and fills the entire house you don't have to keep it alight for so long so you can certainly get a good few uses out of it that's for sure. What is your favourite Christmassy candle at the moment beaut's? I'd love to know!